Solve design challenges while making informed decisions. GrafiCalc® is groundbreaking software that enables you to “sketch & solve” a wide range of mechanical engineering design challenges while making informed decisions in real time. That is possible because GrafiCalc allows you to bi-directionally associate constrained geometry and “smart” calculations in the same worksheet to capture the functional intents of your design challenge. Then if any numeric or geometric parameter is varied, the entire worksheet is automatically recalculated in real time to deliver the updated solution. The interactive feedback from GrafiCalc makes it uniquely suitable for rapid analysis of design alternatives and validation of critical engineering parameters at any stage of the product development process. 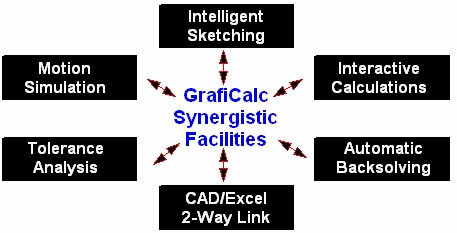 GrafiCalc can be used standalone as well as in conjunction with Microsoft Office and all popular CAD applications on any computer running any version of Windows. "GrafiCalc has saved us considerable time in the modeling and optimization of the geometry used in our positive displacement machinery. What we used to do with geometric data from our CAD system and numerical data from our spreadsheet models is now entirely done within GrafiCalc at a fraction of the time that it used to take. Consider me a satisfied customer!" "We used GrafiCalc in the conceptual design stage to develop the equations for linear motors that drive food-processing machinery. Information received from GrafiCalc immensely helped us to design the optimal machine using SolidWorks." "As a consulting engineer using AutoDesk Inventor I find GrafiCalc an invaluable contributor to my practice providing machine design and product development services to clients. Anyone involved in tracking complex machine movement or forces or a myriad of other engineering tasks would enjoy a great advantage by employing the power of GrafiCalc." "Excellent knowledge database, eLearning videos are great tools to understand GrafiCalc capabilities, email support is fast and precise. It's exciting to learn how much we can do." "We're very pleased with the friendly and timely service from GEOMATE Company. It's a rare treat in today's world"
- G. & H. Burrow Ltd.
"GrafiCalc pays for itself every time I setup a problem."